Living in the city would also mean living in small spaces. As housing developments in the past decade have shifted from horizontal to vertical, families today have to face the limits of their home living. It's a bigger challenge too for homeschooling families who need additional space - for our homeschooling stuffs, actually. But fret not, we can always do something about it (wink, wink). I admire videos about homeschooling room ideas that I've seen in YouTube. They all look great which I would like to copy but couldn't because of the limited space that we have in our house. As much as I would love to, there's just no way I can make an additional room in our unit. We would just have to work around it. Here are some tips I've learned to maximize our homeschooling journey in a tight space. We are pretty new to this so I bet this list would change in the near future. The world is a big classroom. Indeed. When we are not out exploring, we use the four corners of our home as our schoolroom. We have to place somewhere our learning materials, right? When you begin to plan your homeschool area, make sure that it is still livable where family members are still able to move around the house without disrupting your homeschooling. 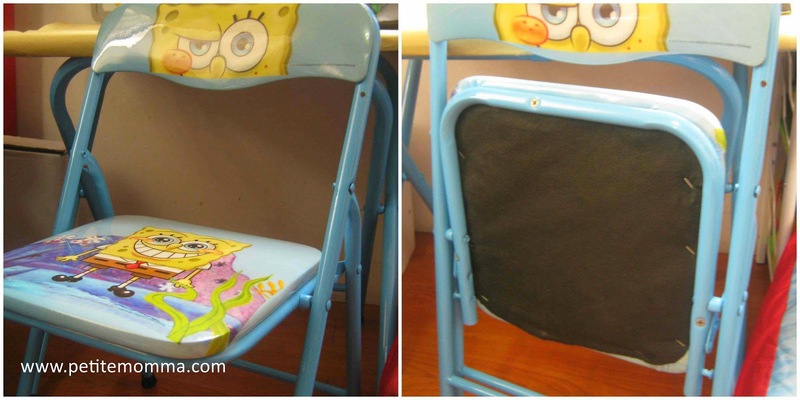 Foldable chairs and tables. This is really helpful since you can move your study table and chair anywhere in the house. If hubby is watching TV during weekends, I move my son's table and chair to the kitchen where we can do his art activities. Moreover, this makes storing easier specially when you need additional space in the living room when you have guests in the house. Inflatable sofa. At the moment, we are using an inflatable sofa and we place it anywhere in the house where my son feels to read. The great thing about inflatables is that when you're not using them and you need additional space in your already cramped house, you can easily deflate and store them in your drawer. Choose the right shelves. All families will have different needs - how many kids are studying, what levels they are in and how much materials they need. All these are factored in when deciding for the right furniture. For us, a small, movable 4-layered open shelves is just perfect. It stores our materials for the week and the eye-level shelves encourage our little one to put away and arrange our materials after each activity. Moreover, he gets to pick which activities he'd like us to work on. Use smaller materials. We decided to purchase a small white board since we don't really need a big one. To complete the set, I added a small board eraser and marker. 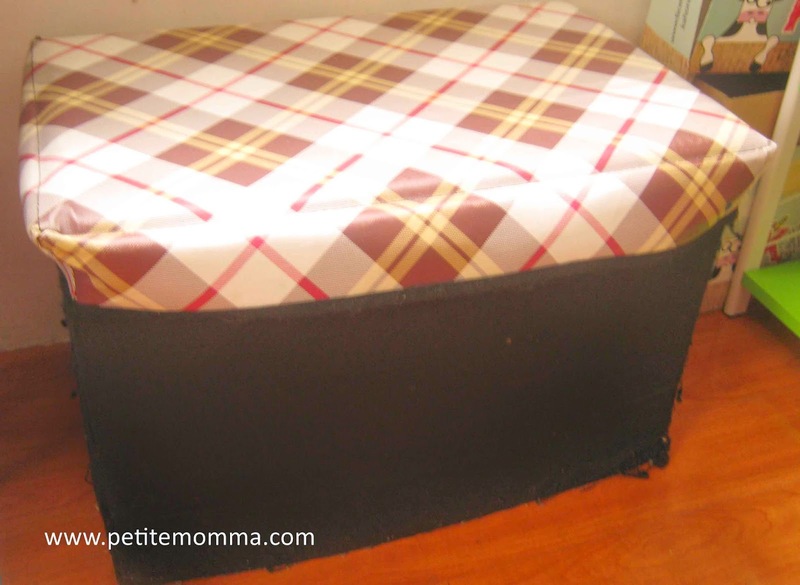 Foldable Ottoman for storage. For our books, teacher materials, and other items we won't be using for the week, we store them inside a foldable ottoman. This is cheaper, I got this one from Divisoria for Php150. Buy only what is needed. We as parents can get really excited to buy all the school supplies our kids need. And I was very guilty of this. But parents, hold. Your. Horses. Ask yourself, "does my child need 20 pencils, 20 erasers, 2 boxes of crayons, 5 coloring books, and 5 reams of paper?" Seriously, you don't need to be a hoarder, it just adds up to your already crowded room. Homeschooling won't stop if the kid ran out of erasers. So buy only what is needed for the month. Minimize the posters on your wall. Unless the poster is part of the topic your kids are studying that week, I suggest that it's best to leave your walls blank. Should you need to set a poster, I suggest you place velcro at the back of the posters and on the wall so that it'll be easier to change them anytime and decrease the sticker residues. Where to place your unused posters? Use poster tubes. Portable DVD players. I initially bought this one because it's energy efficient. However, I realized that it's all I need since we can use it as a DVD player, and a CD player for our music. No need for me to buy a separate CD player. Saves me money and space. It easily fits inside the drawer, too. Use resealable bags for storage. I found out that storing manipulatives in ziplock bags are better than using their original packages as it gives us more space in the shelves. Instead of buying too many workbooks for your kids to work on that would later be a problem in storage, why not try using online resources. There are many websites that offer free worksheets that you can print and/or work on online. My little one enjoys some of the online activities we do like in Starfall's. Download e-books instead of published materials to save space. Ask scratch papers from friends and family instead of buying new reams of paper. Cover your child's study table with used Manila paper when working with activities that would require paint. If you have a plastic cover, you can use that instead. To save on ink and paper, laminate your worksheets. Better yet, buy inserts of paper protector and use dry-erase markers. A pack of paper protector/inserts cost me around Php20 for 10 pieces. For those like us who don't have gardens or garage as extra places to study, do your worksheets and activities in a park, or your community's clubhouse. Visit your local public library. 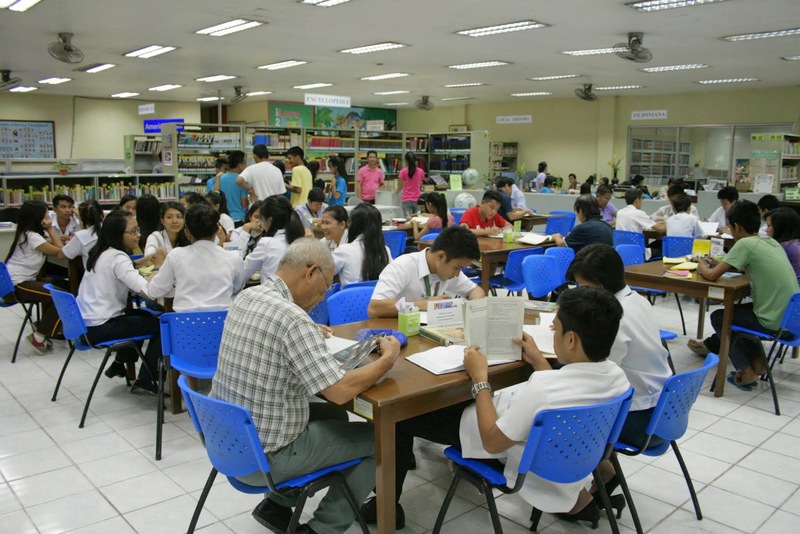 Here in Quezon City, you can borrow books from the public library up to a week. Check more on their website. We have not tried this yet but would check it soon. Borrowing books would not only save us money it saves us space in the house, too. These are just some tips you can do when starting your homeschooling room/area. How about you, what other tips can you recommend for small-spaced homeschooling? I'd love to learn from you. Hi Petite Momma! This is my first time here and I have learned a lot. We also have a small space and we use all of it for our homeschool activities. After reading your post, I'll definitely look for a nook where we can do all our homeschool activities. You're QC based pala. Dulo-dulo pala tayo. Maybe we can meet half way and share some notes too. Are you going to The Learning Basket's Literature-based Preschool Homeschool workshop this July 12? If yes, that could be our first date! See you soon! This a very bright idea! Will start organizing my son's study area this weekend. Superb! Great advice. We currently live at my parent's house and although 1 year old pa lang yung daughter ko, there's so much stuff around the room na - toys and many more. Hahaha. We're planning to move by the end of this year into a very tiny house kaya this will help a lot, especially since we will be hoarding, este acquiring homeschooling resources/ educational toys in the coming years. Reading posts about homeschooling like yours really inspires me. I hope I could somehow homeschool my kids, too. Thanks for dropping by, Millie :) Good luck! Greetings from one fellow homeschooler to another! 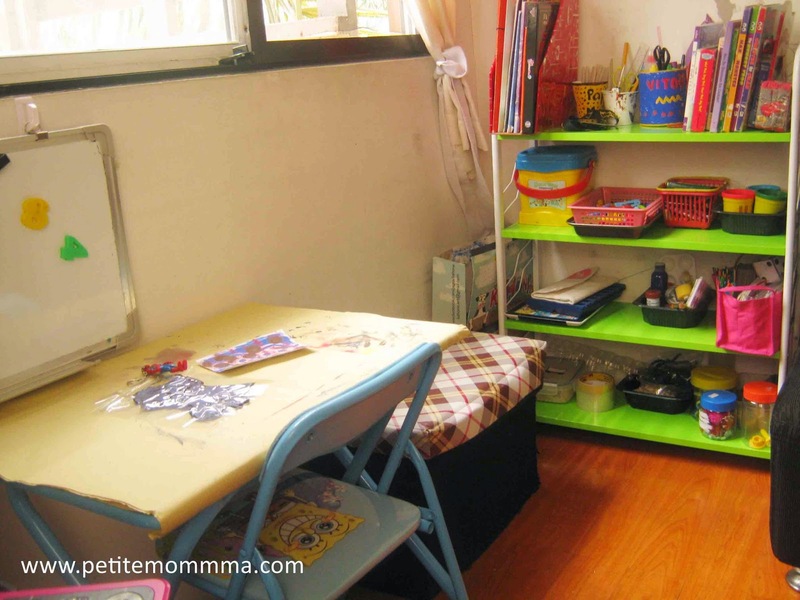 Enjoyed reading your posts and how you make use of small spaces to maximise the homeschooling experience. Like you, I admire those study rooms with bountiful spaces. But it's never quite possible given the small plot ratio we have here! Haha! Laminating worksheets are the best! Thanks for your tips. One of the great things about homeschooling is that you can give your child one on one attention and help. This one on one attention helps you to see how your child is coping with the different subjects. I agree, Anne. I learned more about my child, it has helped us identify and provide the best ways where he can learn. Thanks for dropping by! I love the tips, you're a quick-learner! Parang kelan lang. I've been seeing online a lot of cool activities in BGC. Oh there are times I wished I still live with my parents so that we can visit BGC. It's too far from our place! Wow momshie another idea.. Sakto itong mga tips mo dahil maliit ang space ng bahay na min.. Na amaze ako sa recycle na ginawa mo lagayan ng mga pencil. Gagayahin ko nga at lagi nakakalat ang gamit ng anak ko.. Thank you for thia tipa momshie..